HER talent for writing had long been kept under wraps but Susan Kavanagh always hoped to see one of her stories in print. Sadly Susan died before her dream could be realised but her family and friends say they are delighted Downend Voice will publish one of her stories as a tribute to the woman who loved to write. Susan, 55, was an avid reader of books, particularly romances. She would often scribble down ideas for stories in a note pad and took to her typewriter to try her hand at writing her own stories. But it wasn't until Susan joined a writing group at Staple Hill Library in January 2015 that her talent was spotted. Diane Simms, Susan's creative writing tutor, said: "Susan was a quiet Fishponds lady whose talent for writing stories was a well-kept secret - until she enrolled in a creative writing class at Staple Hill Library. "She went on to be a key member of the group that developed out of the course, Staple Hill Scribblers. Even Susan’s close family were unaware of her passion for writing. As we discovered during the creative writing classes, Susan’s dream was to have a piece of her work published. It's really good that Susan's story will appear in a magazine in her local community. "Susan wrote very naturally about ordinary people and their motivations. She shows us their personalities through her dialogue and description, without lots of unnecessary explanation. That is the mark of a talented writer - show, don't tell." 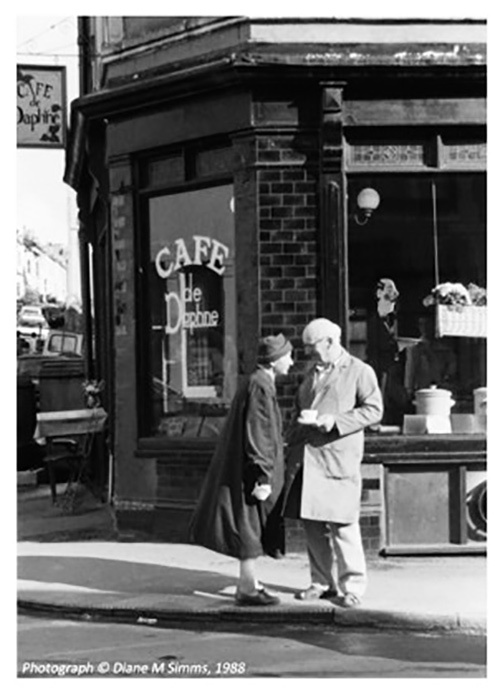 The story published on the right, Frank and Molly, is based on a black and white photograph of a couple standing outside a café. Members of the Scribblers group were allowed to imagine the scenario as happening wherever and whenever they wanted and were asked to write a short story inspired by the photo. Frank and Molly was Susan's first piece of work in the group. Susan, who had various jobs in the past including charity work, wrote her story from the perspective of an older man who, while reminiscing on past times, mistakes a lady walking past the cafe as a nurse who had tended him in the Great War. Sadly, Susan died suddenly in March this year after suffering an epileptic seizure. Dave, her husband of 29 years, said: "Ever since I knew her, Susan had been interested in writing. "It was her passion. She was always writing and jotting down stories in her exercise book or on her typewriter. Susan also loved reading and there were hundreds of paperbacks around the house. Romance was her favourite. "She would have loved to have seen one of her stories in print. I'm very proud of her." FRANK Walker looked out of the café window. He watched people go past. Peace at last! He managed to get away from his sister Dottie. The woman was a nightmare to live with, always nagging him. If he had wanted a nagger, he would have got married. He was a confirmed bachelor. There had only been one woman for him. Her name was Molly. It was during the war. She had been a nurse, he a soldier. The year was 1916. That war had ended over forty years ago. He stirred his coffee. He hated these small cups. You couldn't get much liquid in them. He often came to this café. It reminded him of the café he went to in France. He and Molly used to meet up there. This café was owned by a French couple. He stared dreamily once more out of the window. He then saw the woman walking past. She was dressed in a dark coat and hat, but he recognised the walk. He stood up, knocking slops of coffee out of the cup which landed on to the saucer. He picked up the saucer absently and went up to the window. The woman stared in, looking at him funnily. He made his way out of the café. 'Molly, is it you?' He held on to the cup and saucer. 'Pardon?' The woman looked at him strangely. It was his sister, Dottie. 'It's not safe for you to wander about on your own. I hope my brother hasn't been a nuisance.' she said to the other woman. Essie watched the couple walk away, Frank clinging on to Dottie like a child. It was sad, very sad. She clung to her brother and smiled.